Click the down arrow on the right side of the blue bar on top to access the Account menu. The Settings page appears. The different sections of this page are shown on the left side. Click Apps on the left side of the page. The Apps tab of the Settings page appears. On the Apps tab, you can see a list of all the apps you use, in order of which you’ve used most recently. Click Edit, located next to these apps, to see more information about how they work with Facebook. The simplest way to adjust how an app interacts with your information is simply to revoke its capability to interact with your information. This option makes sense only if you are 100 percent done with an app. To remove an app, click the X next to its name in the list of your apps. A window pops up explaining that doing so removes it from your Facebook account, but that the app may still have some of the data you shared with it. You can then choose to delete all the app’s activity on Facebook by selecting the Delete All Your <app> Activity on Facebook check box. Clicking the Remove button finishes the process. When you remove an app, you will no longer be able to use the app, and it won’t be able to send any information or posts to your Timeline or invitations to your friends. Click Edit next to the app’s name in the Apps You Use section of the App Settings page. This expands details about the ways this app can interact with your information and Timeline. Click the Privacy drop-down menu. It’s next to the section Visibility of App. Select who can see posts from this app. You’ll find the following privacy options: Public, Friends of Friends, Friends, Friends Except Acquaintances, Only Me, or a custom set of people. Selecting Only Me is a quick way to make sure that no one will see posts that the app creates on your behalf. As an alternative to changing who can see posts an app makes, you can revoke an app’s capability to post to your Timeline altogether. Look in the This App Needs and the This App Can Also sections to see what permissions the app has. Every app will list here that it can access your basic information and send you e-mail. Depending on the app, it will also list any other Timeline info it requires and whether it can post on your behalf or access your information when you’re not using the app. Click the X next to Post on Your Behalf or Access Your Data Any Time to revoke these permissions, respectively. If you revoke the Post on Your Behalf setting, the app will no longer be able to make posts on your Timeline; if you revoke the Access Your Data setting, the app will no longer be able to access your data when you are not using it. Apps may contact you via the Notifications section of your Home page. If you’re being bothered by too many notifications, you can turn off this capability from the App Settings page. Use the drop-down menu in the When to Notify You section to select Never. If you previously turned off notifications and want to turn them back on, select The App Sends You a Notification. Hide from News Feed. If your News Feed is inundated with posts from apps, click the small gray arrow that appears when you hover over that post. A menu of options appears. When you click Hide, the post disappears from News Feed and is replaced by text confirming that it has been hidden. Click the black Hide All Stories from <app> text to hide all future posts. Block an app. If you find an app offensive or it keeps sending you invites or requests, you can block it. From the Settings page, navigate to the Blocking tab using the left menu and enter the app’s name in the text field in the Block Apps section. 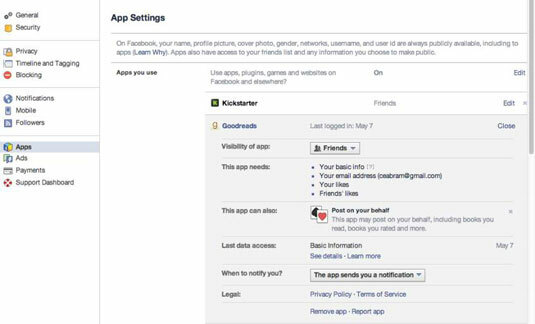 The app will no longer be able to contact you via Facebook or see any of your info. Block a friend’s invites. Sometimes just one person is the problem. Navigate to the Blocking section of the Settings page, and enter your aunt’s name into the text field in the Block App Invites section. Then, any invites or requests she sends you will automatically be ignored and won’t generate any notifications on your Home page or in your e-mail.